To turn off the engine (START/RUN position) or vehicle power (ON position), press the engine start/stop button with the shift lever in the P (Park) position. When you press the engine start/stop button without the shift lever in the P (Park) position, the engine start/stop button will not change to the OFF position but to the ACC position. You are able to turn off the engine (START/RUN) or vehicle power (ON), only when the vehicle is not in motion. In an emergency situation while the vehicle is in motion, you are able to turn the engine off and to the ACC position by pressing the engine start/stop button for more than 2 seconds or 3 times successively within 3 seconds. If the vehicle is still moving, you can restart the engine without depressing the brake pedal by pressing the engine start/stop button with the shift lever in the N (Neutral) position. Press the engine start/stop button while it is in the OFF position without depressing the brake pedal. The electrical accessories are operational. If the engine start/stop button is in the ACC position for more than 1 hour, the button is turned off automatically to prevent battery discharge. Press the engine start/stop button while it is in the ACC position without depressing the brake pedal. The warning lights can be checked before the engine is started. Do not leave the engine start/stop button in the ON position for a long time. The battery may discharge, because the engine is not running. To start the engine, depress the brake pedal and press the engine start/stop button with the shift lever in the P (Park) or the N (Neutral) position. For your safety, start the engine with the shift lever in the P (Park) position. If you leave the engine start/stop button in the ACC or ON position for a long time, the battery will discharge. Never press the engine start/stop button while the vehicle is in motion. This would result in loss of directional control and braking function, which could cause an accident. Before leaving the driver's seat, always make sure the shift lever is engaged in P (Park), set the parking brake fully and shut the engine off. Unexpected and sudden vehicle movement may occur if these precautions are not taken. 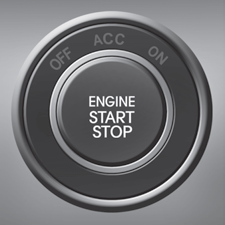 Never reach for the engine start/ stop button or any other controls through the steering wheel while the vehicle is in motion. The presence of your hand or arm in the area could cause loss of vehicle control, an accident and serious bodily injury or death. Do not place any movable objects around the driver's seat as they may move while driving, interfere with the driver and lead to an accident.